Having just moved to border country on the North East Coast, that is the border between North Yorkshire and what lies beyond, the couldn’t be missed opportunity to create yet another, One & Other, presented itself when I saw the Vertical Pier at Redcar for the first time. The Redcar Beacon / Vertical Pier to the people of Sunny Redcar, as they wanted a traditional replacement for the one they used to have, shot to national fame when it was voted onto a shortlist of six projects announced by Building Design magazine. 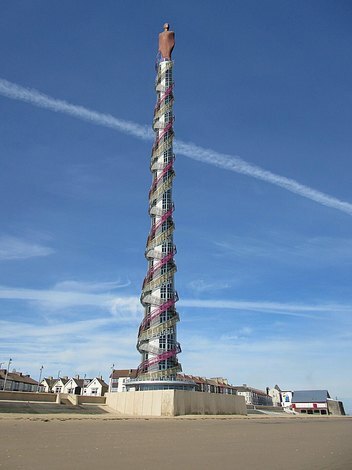 Its annual Carbuncle Cup competition claims to recognise the worst architectural projects. The cup proved to be beyond the grasp of Redcar, and they failed to bring it home. Perhaps they would have better luck with this version ?